With autumn on the horizon, we’ve taken several calls from plumbers about connecting our Hep2O push-fit plumbing system to radiators. Here’s all you need to know. Hep2O pipe is compatible with most other makes of fittings, but when connecting it to cylinders and radiators, you should use Hep2O fittings wherever possible. The Hep2O range includes double check valves, tank connectors, gate valves, stopcocks and cylinder connectors. If the use of compression fittings is unavoidable, then check out the jointing instructions outlined on page 24 of our Installer Guide, available to download here. 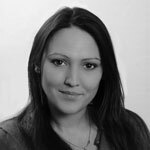 There are distinct advantages to using 10mm Hep2O pipe instead of microbore copper feeds to radiators, one being that Hep2O pipe can easily be accommodated behind ‘dot and dab’ to give a pipe-free appearance within a room. Unlike copper, it’s not prone to damage such as dents or kinks which can be caused on ‘soft’ copper by other follow-on trades. 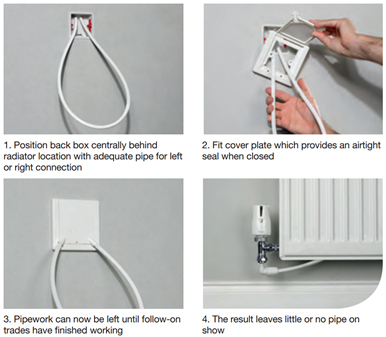 A handy solution when using 10mm Hep2O pipe is to utilise the HX113 Hep2O Radiator Outlet Cover Plate. 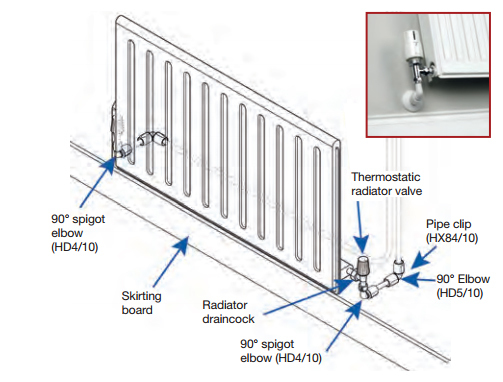 Fitted in conjunction with a back box, this cover plate provides a neat, easy-to-install method of connecting radiators. It also has the benefit of a hinged flap that provides an airtight seal. The box is fixed in a central position behind the radiator with the 10mm pipes dropping out to the radiator valves. This gives a smart professional finish where little or no pipe is seen and, for new build, provides an anchor point for the pipework prior to plastering/boarding as shown below. For fixing pipework to lightweight blockwork, use wooden dowels at each clip position. The HX65 pipe clip is not suitable for fixing directly to such walls because of the low pull-out resistance of the nail.